Established in 1971, Breffni Group in Kilsallaghan, Co Dublin has earned a reputation for reliability amongst its loyal clientele. Kenny Conlon is the company’s Plant Manager explained to Building Ireland all about the thriving business. Thankfully, business is going really well for Breffni Group as they continue to be immersed in projects all throughout Dublin, the rest of Ireland and even further afield. Breffni Group’s strong work ethic and reputation for reliability, which was established with the company in 1971, now stretches across a growing number of services. The continued success is a result of a strong work ethic at the firm and its strength lies in the ability to easily adapt to evolving circumstances with an expansive fleet of plant and equipment which used to facilitate the smooth running of operations. Plant Manager Kenny Conlon started with the company when he was just 16 years old and is proud to say that he has “worked his way up” to his current post with the firm. He took the time from a hectic schedule to outline to Building Ireland what Breffni Group is all about, as well as discussing some of their past and present projects. “At the moment we have close to 80 employees working in many different sectors of the business including building construction, civil engineering, utility works, railway maintenance and manufacturing. Recently we have assisted Sisk Steconfer JV on the Cross City Luas Project and they’re a client that we’ve done a lot of work for down through the years,” he stated. The last couple of years have seen a real turnaround for the company, particularly in the Dublin area. Indeed Breffni Group has a team of experienced surveyors and civil engineers that are ready to give no obligation quotes for all types of Bulk Excavation Contacts regardless of size or type of material to be removed. They are available to share knowledge and advise on best practice and ensure that each contract is carried out efficiently and to the highest standard. 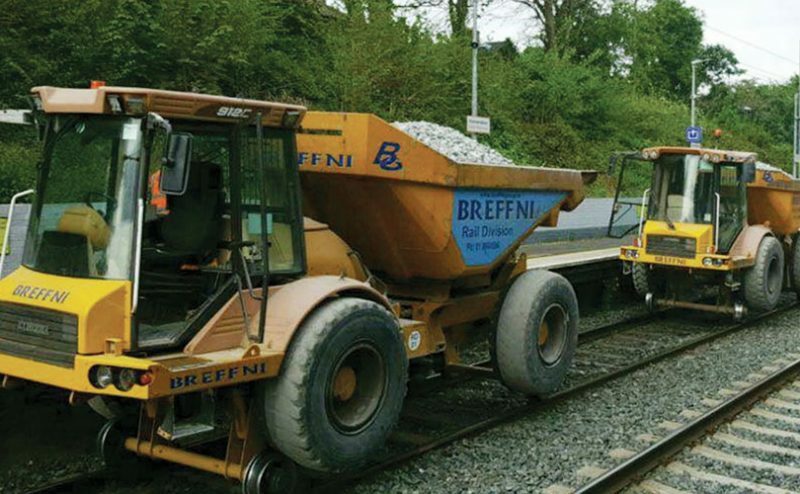 With regards to their experience in the rail division, Breffni Group has gained its expertise in rail development by having worked at the forefront of Irish rail construction and upgrading since the 1980s. The company supplies a range of rail plant including; Rail Road Excavators / Rail Dumpers / Rail Dozers and Standard Suction Excavators and Rail Road Suction Excavator all of which are fitted with high specification safety requirement features – height limiters, slew limiters, on-going valve checks and reversing cameras. A past significant project for the company was the DART upgrade which involved Mast Base Construction and Mast Erection on the entire Dublin network and liaising with many operators involved in construction and bridge erection. On the transport and logistics end, Breffni Group offers its clients a nationwide transport facility for plant, machinery and heavy duty equipment through the fleet of transport vehicles it possesses low loader carrying availability and trombone trailers that can take items up to 60ft in length. Some of the low loading vehicles are equipped with a crane that enables moving equipment onto lorry without the need for separate lifting equipment. The fleet at Breffni Group enables the company to transport vast amounts of materials anywhere in the country, while they also have a storage facility that spans several acres to accommodate this for long periods. As well as this, Breffni Group also offers a deposits timber, plastic and other waste products at accredited recycling centres nationwide ensuring that contaminated and dirty waste such as asbestos is disposed of in an environmentally friendly manner at approved sites. They also handle all the necessary documentation. Overall the picture is very bright for the company with the growth continuing on a gradual basis, according to its Plant Manager.